Calamondin oranges or China oranges are also called kumquats and the many names suggest how popular these miniature oranges are. Most people grow it for the ornamental value these brightly coloured fruits bring in the garden but those who love making preserves have better ideas. 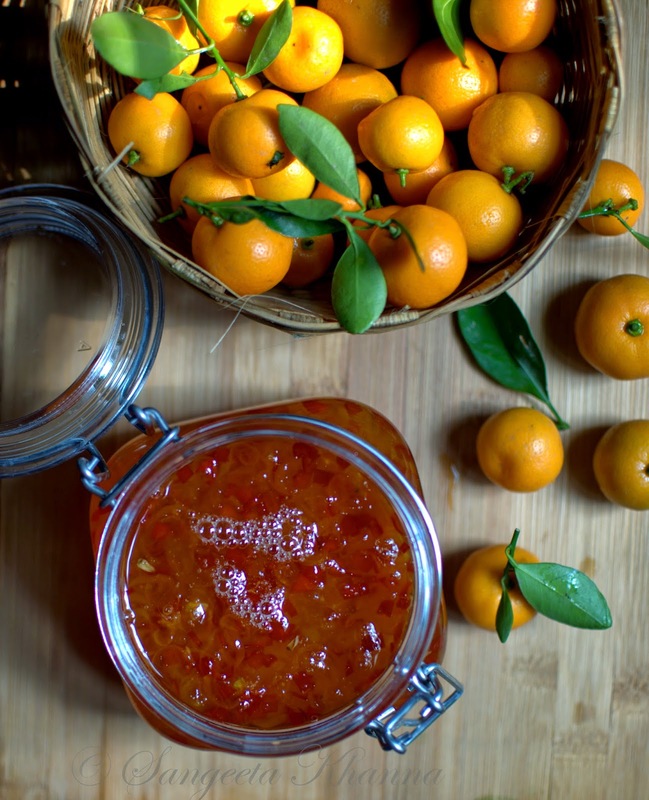 These calamondins/kumquats/China oranges make really good marmalade. And I love citrus marmalade of all types. 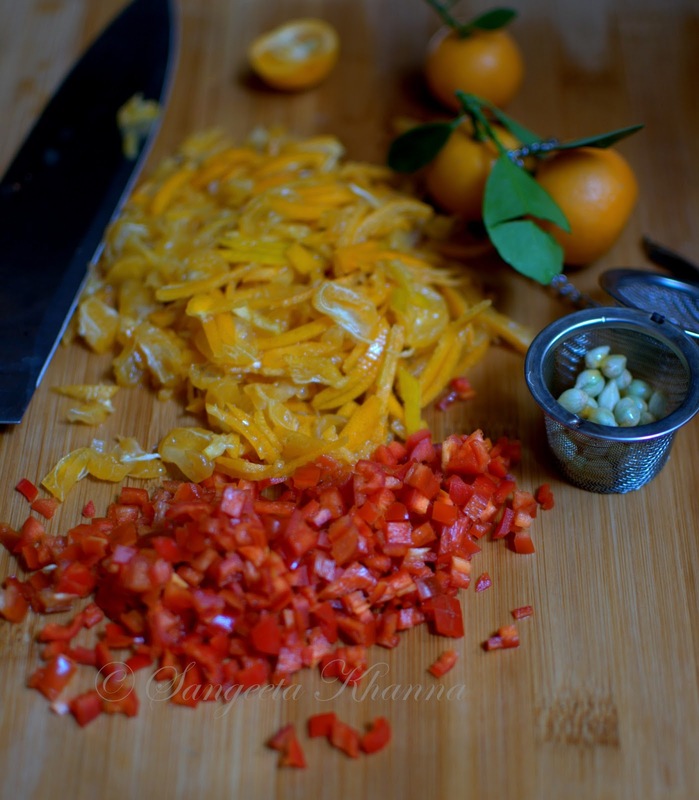 Kumquat chilly marmalade is something I would love adding to my stir fry salads and a few grilled chicken recipes. The lovely sweet tang with a hot kick is just irresistible. Something you would just need a small amount to get a packed punch of flavors. The fat red chilies in the season are normally valued for the stuffed chilly pickle most people relish and even I used to make long time back. That was not because I liked pickles very much but I wanted to master them all, with an impression that pickling is something only a few can do. How stupid I was later I learned, pickling is easy as a technique, just consumes a lot of time and then I lost interest. But these fat red chilies kept hogging my attention whenever I saw them in markets. I still buy a few during my weekly veggie shopping and use them in salads, in omelets and even in soups sometimes. A chilly kick is something that can transform the food. It's no secret that I love garlic and I love chilly. I love all fruits too, the more the fruit is vibrant the more it makes me go mad about it. That's why when I saw Deeba making a lot of goodies with these Kumquats that grows abundantly in her garden, I couldn't stop asking her to bring me some next time we meet. I had told her already that they will meet my chilies to make a saucy jam. 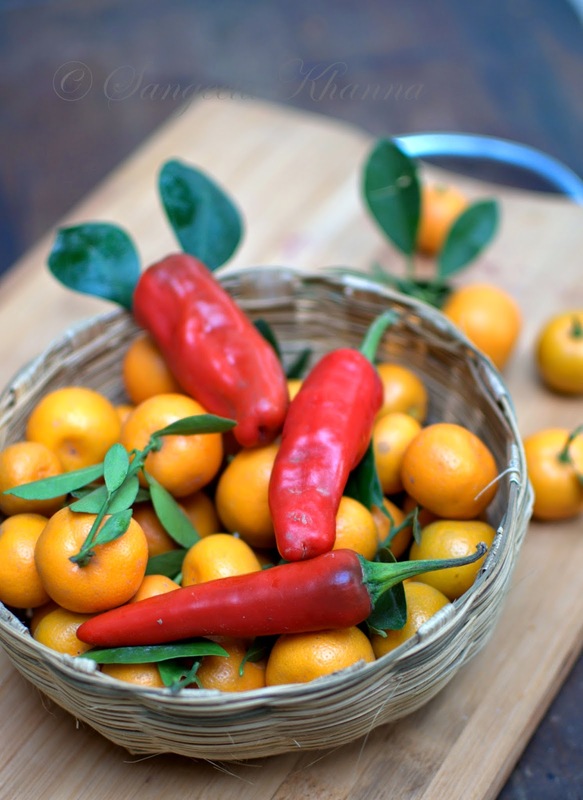 These Kumquats are actually Calamondins, citrus fruits of the uncommon type are often difficult to identify as there are so many varieties owing to the incestuous breeding of the varieties. Some varieties of this Calamondin are way too bitter than this one and yet make wonderful marmalade. 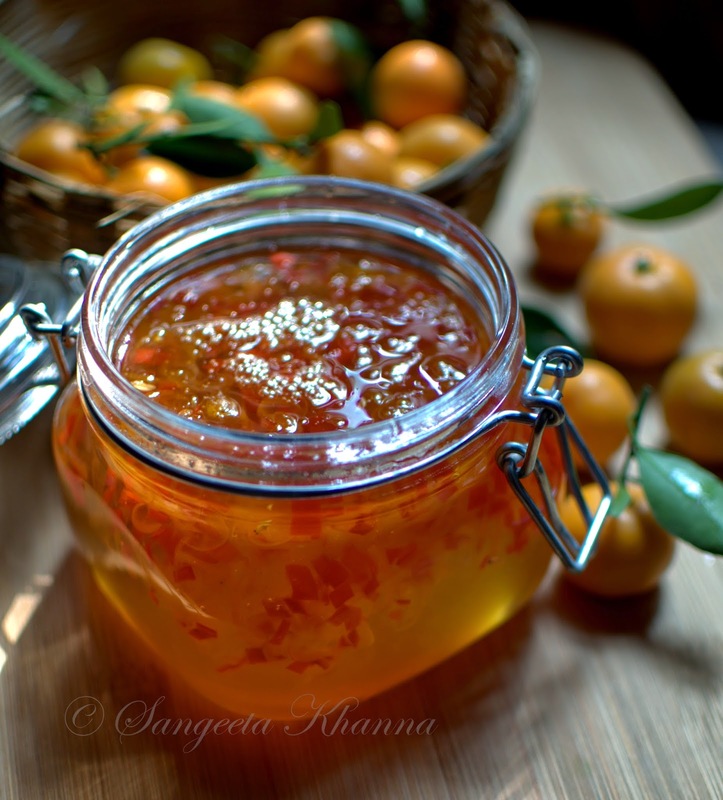 Since I had a stock of marmalade already, and Deeba had gifted me a bottle of this Kumquat/Calamondin marmalade too, I decided to convert them all fruits into this saucy marmalade. Yes the fruit are miniature in size and there was a lot of chopping to do. The seeds were separated and enclosed in a tea strainer. And then everything was cooked together in a wide pan. Mix everything in a wide pan and suspend the strainer with the seeds into the pan. You can tie the seeds in a muslin cloth and suspend it similarly. The idea is to extract pectin from the seeds while cooking. The cooking mixture turns a little frothy first and then starts becoming glossy. 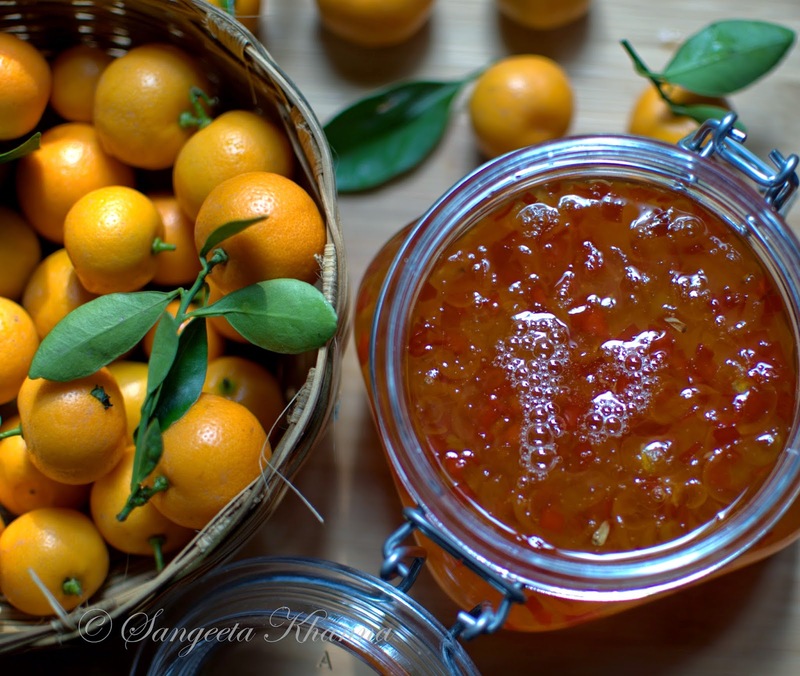 If you want a marmalade you can always follow the same procedure as this citrus marmalade. This one I made a little saucy so it can make a good accompaniment to grilled chicken or fish. Or just like a sweet chilly sauce. You see the picture. There is nothing complicated about this recipe. If you make it the consistency of almost jelled it will be well preserved. If you make it a bit saucy, you would need to refrigerate it. Sugar is the preservative so reduce it enough so the sugar concentrates. See details of a generic marmalade recipe here to understand the procedure better. We have been using it for many things. On crackers, with carrot sticks, slathered over baked potatoes and sometimes just a blob of this sauce on the side of whatever is on the plate. 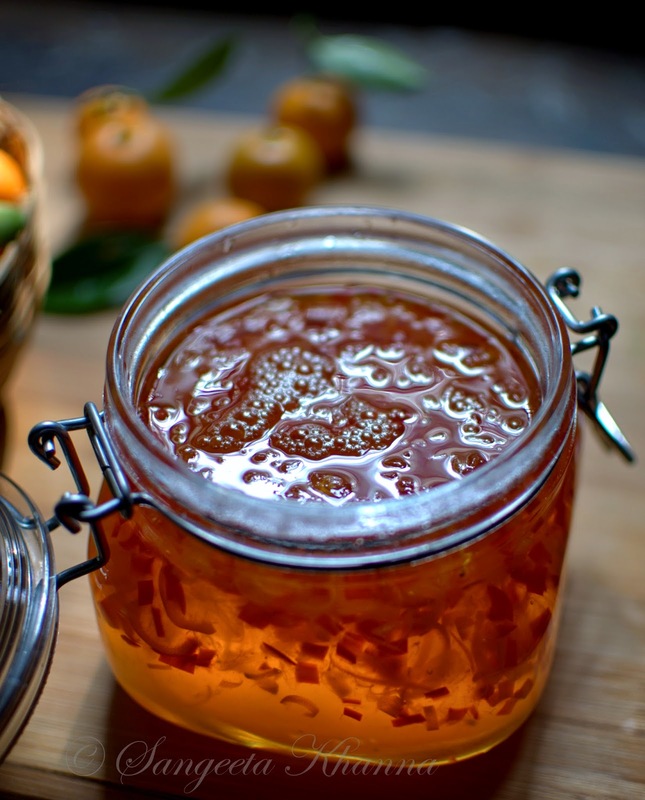 Don't forget to see those specks of beautiful red in this jiggly marmalade. 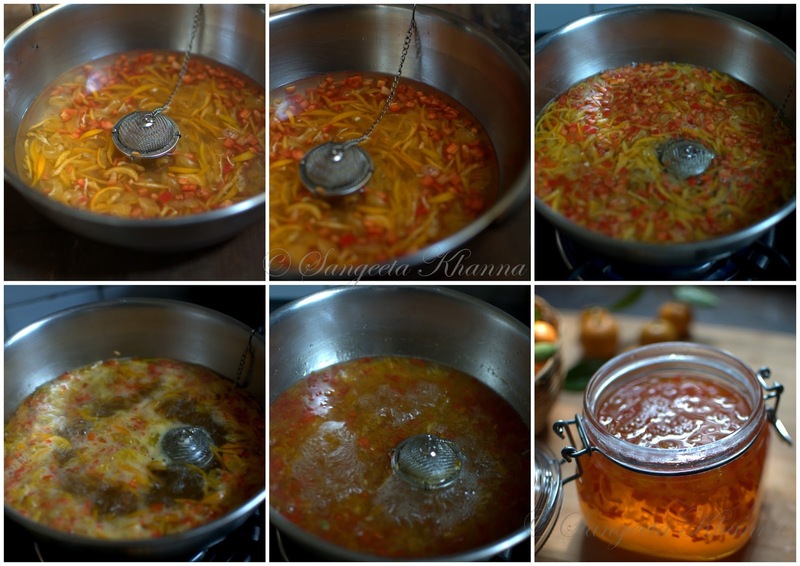 kumquat and chilly marmalade : a hot and sweet condiment for salads and bakes..
pics taken in day light are the best. beautiful jam. The pics look so delicious ! 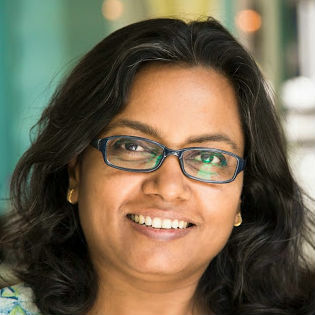 I think when I come to Delhi I need to raid your house ! seriously ! This looks delicious...thanks for the recipe.